Nocturna in the Dark Tint colourway from Alexander Henry's 'Nicole's Prints' collection. 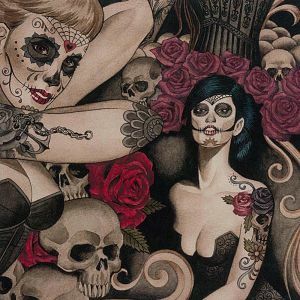 Tattoo pinup ladies with sugar skull painted faces with roses and skulls. Similar in style to the Las Elegantes print by Alexander Henry but with more contrast, different artwork and generally a smaller scale pattern.